Herbert Suchy, viola, has given recitals and performances as soloist with the philharmonic orchestra of Bad Reichenhall and with the Tonkünstlerorchester Niederösterreich. As a chamber musician he is member of various formations, e.g. 5 years with the Hugo Wolf-Quartett Vienna. In addition to this he leads the viola section of the Academia Allegro Vivo Chamber Orchestra. 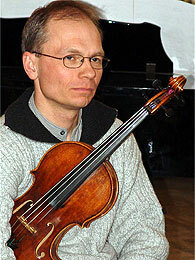 He also acts as coordinated leader of the violas in the Tonkünstlerorchester Niederösterreich.